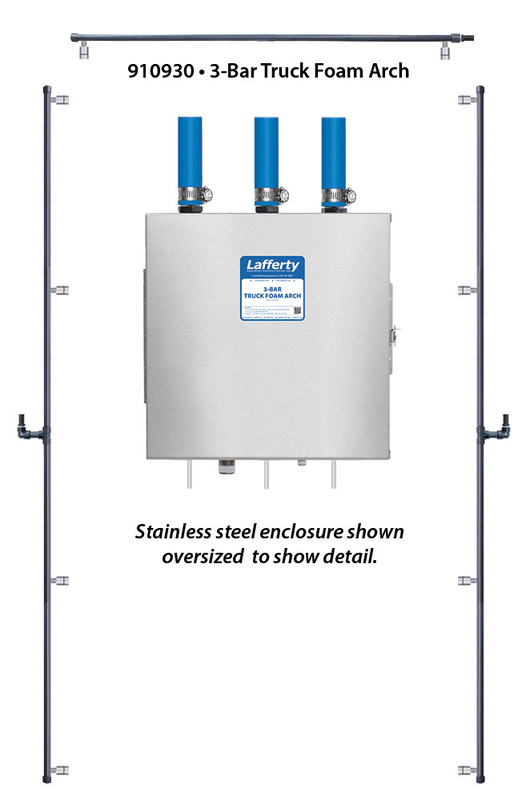 3-Bar Truck Foam Arch | Lafferty Equipment Manufacturing, Inc. The 3-Bar Truck Foam Arch is a drive-through foam applicator for washing large vehicles and features 3 foam bar assemblies mounted above and and at the sides of the vehicle for complete coverage. This venturi injection unit uses city water pressure (40 - 125 PSI) to draw and blend chemical concentrate into the water stream to create accurately diluted solutions using precision metering tips. For optimal performance, water pressure should be 50 PSI or higher. Compressed air is injected to greatly increase volume and coverage ability, creating rich, clinging foam that is projected through multiple fan nozzles on each foam bar. The foam consistency (wet/dry) can be adjusted.